High Peaks Pure Earth is very grateful to Elliot Sperling for his translation of a blogpost by Woeser originally written for the Mandarin service of Radio Free Asia on May 4, revised on May 6 and posted on her blog on May 7, 2013. 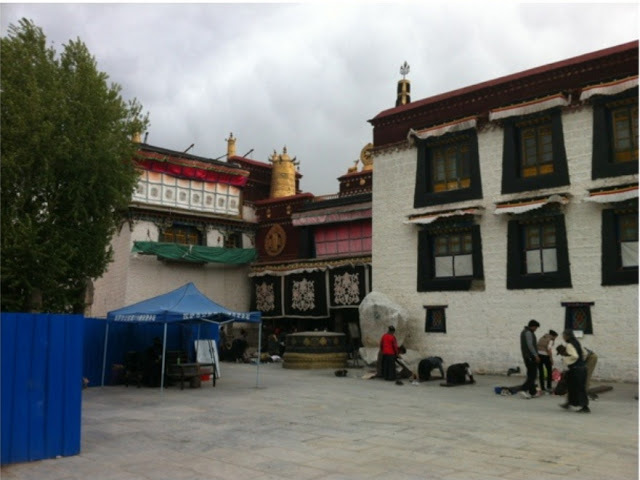 The blogpost is an appeal to save Lhasa from destructive modernisation and has already attracted media attention. It was reported by Associated Press in Beijing in December 2012 that Lhasa’s government had started a seven-month, 1.2 billion RMB project to “help preserve Lhasa’s ancient heart”. As a place that Woeser considers to be her home, Lhasa is often written about in both poetry and prose. Previously, Woeser has expressed her concern about the pace of changes taking place in Lhasa today. 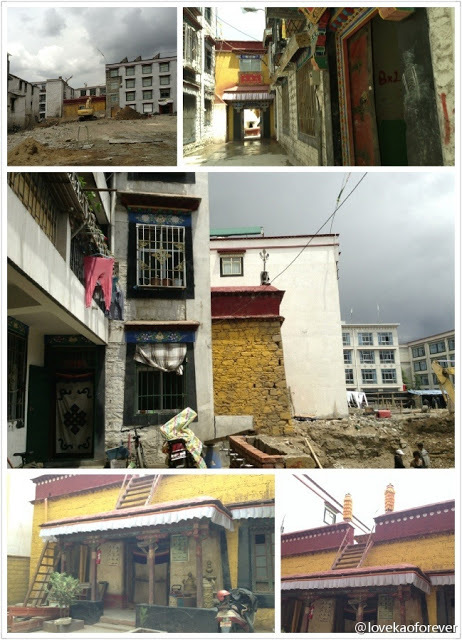 Please note that nowhere in the blogpost is the claim made that Tibet’s holiest temple, the Jokhang, is being demolished. Please scroll to the bottom of the post to see 20 more photos. 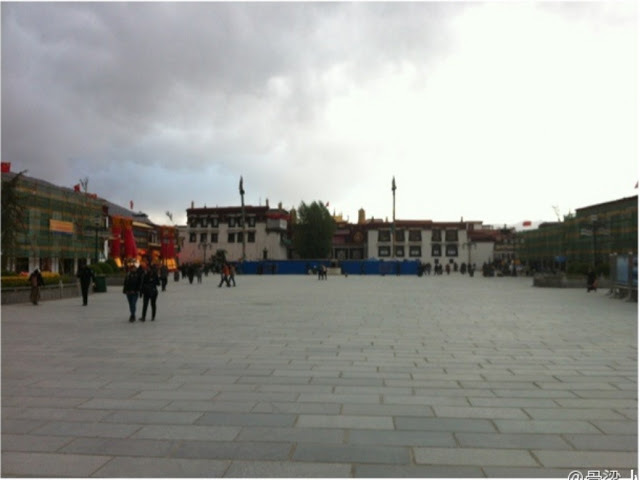 The space in front of the Jokhang, which has borne witness to so much change over the ages, has no more of the pilgrims from Kham and Amdo who prostrate themselves all the way from the far borders to Lhasa; no more lamp pavilions in which thousands and tens of thousands of butter lamp offerings were lit every day. 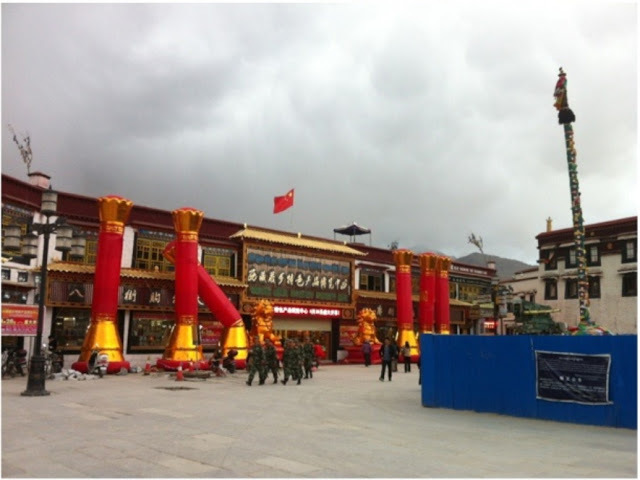 Only snipers poised on the roofs of Tibetans’ homes, and fully armed military sweeps; only the opening of one massive government-business sector joint venture shopping mall after another, each with inflatable blood-red plastic columns before their doors, flaunting the vulgarity and invasiveness of these new upstart operations. 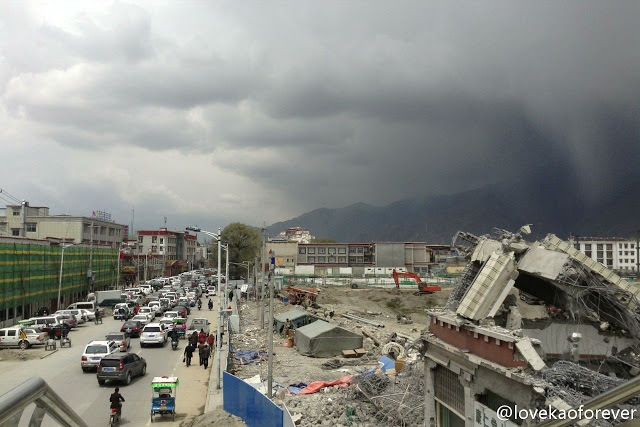 Our Lhasa is on the verge of destruction; this is absolutely not a case of crying wolf! Note that among the photographs that this tourist posted, the “Construction Survey” for the Barkhor Shopping Mall (originally the site of the Chengguan District Government Headquarters; located in the northeast section of the Barkhor, the circumambulation route around the Jokhang, and located very close to what is generally called Barkhor Street, also within the Old City of Lhasa) presents the scope of the project as encompassing 150,000 square meters, with an underground parking garage alone containing 1,117 parking spaces. 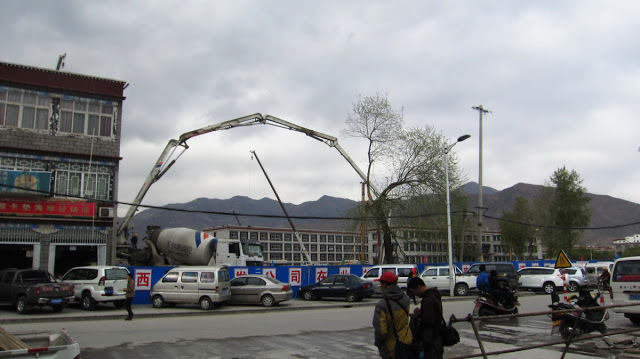 Moreover, last year, because the colossal “Spiritual Power Plaza,” a government-business sector joint venture built at the edge of the Old City of Lhasa, which had yet to open, was constructing an underground parking garage, it was pumping out groundwater day and night for over two years, causing anxiety among Lhasa residents as well as worries about cracks ripping through the Old City of Lhasa and depressions that could reach the dangerous point of forming sinkholes. Actually, cracks have already appeared in many places, while excavated sites have no water. And now the authorities want to construct a huge shopping center with an underground parking garage in another part of the Old City. Does this mean that we’ve reached a point at which it is now nigh impossible to prevent Lhasa from falling into the destructive clutches of hungry ghosts? Remember: in 1994, UNESCO placed the Potala Palace on the World Heritage List. But then, in 1996, the village of Shol, which had stood for 1100 years at the foot of the Potala Palace was moved and relocated. At the same time, the Potala Palace, now deprived of Shol, was fatally disfigured with a public square: a replica of all those identical squares found throughout China, that are meant to display and project supreme power and authority. In 2000 and 2001 UNESCO listed the Jokhang and the Norbulingka on the World Heritage List as extensions of the Potala, making Lhasa, already a sacred place in terms of its value for religion, history and the humanities, a part of the world’s cultural heritage. Nominally then, it ought to receive protection simply as a matter of course. But in 2002 Tibetans received a deep wound to their hearts: an artillery shell-shaped “Monument to the Peaceful Liberation of Tibet” was put up to tower easily over the square, facing off against the Potala Palace in the distance. In 2007 the Potala Palace received a “Yellow Card Warning” at the World Heritage Conference, with criticism leveled for the excessive and gross pursuit of tourism profits, for unrestrained exploitation and for failing to uphold its responsibilities and commitments. The Potala Palace was put at risk of losing its “World Heritage” designation. Years ago, between 1996 and 2002, Andre Alexander, a German who had devoted himself to restoring the Old City of Lhasa, in concert with the Tibet Heritage Foundation which he founded, rescued 76 traditional structures in and around Lhasa and revealed the true state of affairs, stating that “starting in 1980 the construction process within the city has wrought unceasing destruction on the Old City’s ancient structures and quarters.” “From 1993 on, each year an average of 35 historic structures have been demolished. At this rate the remaining historic structures will have vanished in less than 4 years.” Because their remarkable restoration work and the witness they bore went totally against the intentions of the powers that be, in the end they were expelled from Lhasa by the authorities in Tibet—authorities who single-mindedly pursue only what is in their own interests. Of course, the Barkhor, which was originally a place of religious significance, won’t turn into a deserted street. On the contrary, it will become a bustling street, existing only for the benefit of tourists. But it will never again be the street of those Tibetans who circumambulate, come on pilgrimage, and prostrate themselves. Even if there manage to be pilgrims making prostrations there, they will simply serve to liven things up as background for the tourists, as one disaster follows another, winding down to a pathetic and miserable end for Lhasa. 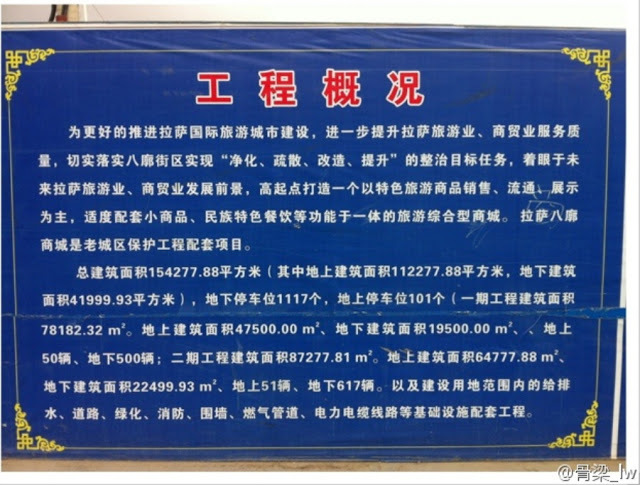 Historically, Lhasa has never had a mining cave-in. And now, it has had a mining cave-in. Historically, the Kyichu has never been blocked and dried up. Now it is drying up to the point that the fish are all dying. Historically, the Old City of Lhasa has never existed solely as a backdrop for tourists. 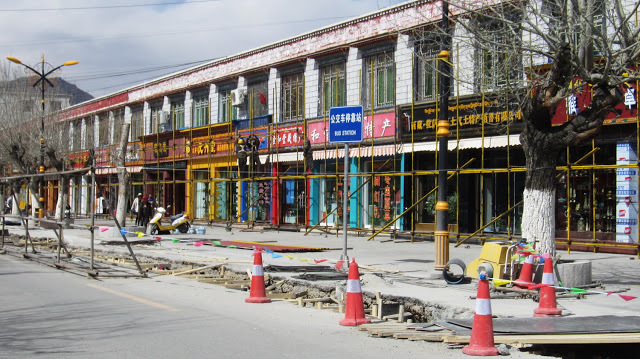 And now it’s being changed into a replica of Sifang Street in Lijiang and Daka Dzong in “Shangri-La.” Might it be that one day, perhaps very soon, entry into the mountain fortress version of these tourist traps, “Old City Lhasa,” will require the purchase of tickets? I should point out that over the last several years the self-immolations of 121 Tibetans have become the most conspicuous manifestation of the Tibet Issue. It matters little that the international community is only paying limited attention to it, it is still the focus of the Tibetan Government-in-Exile; everything is concentrated around it and other catastrophes and dangers faced by Tibetan society are getting scant notice. 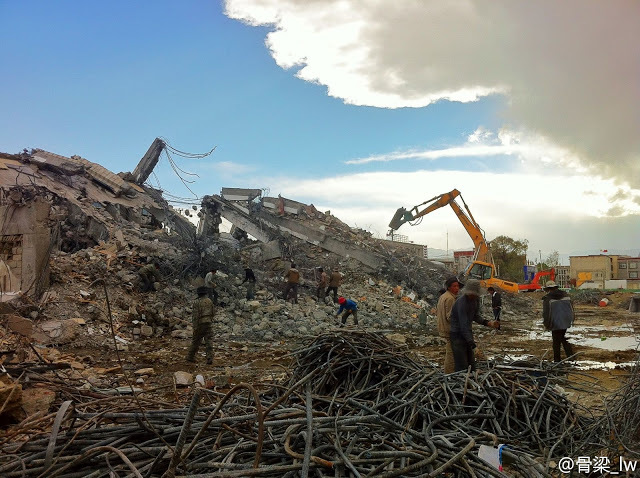 For example, right now the looming destruction of Lhasa’s Old City is staring us in the face. If this were taking place in the past, UNESCO could still issue a “Yellow Card Warning.” However, now no one is paying attention, no one is concerned. But the Chinese Government is taking the Tibetan self-immolations very seriously. On May 27 last year two Tibetans committed self-immolation in the space between the Jokhang and the Barkhor police substation. The Barkhor police substation was immediately elevated to the level of “Barkhor Ancient City Public Security Bureau.” The Mandala Hotel in which the two Tibetan self-immolators had taken lodgings was seized by the authorities and turned into the “Lhasa Barkhor Ancient City Management Committee.” The Old City of Lhasa was renamed the “Barkhor Ancient City.” But the large-scale rebuilding of the Old City by the authorities that resulted from this was actually a case of killing two birds with one stone; it was even more suited to the goals and plans for “maintaining stability.” And now, the area in front of the Jokhang, which has borne witness to so much change over the ages, has no more of the pilgrims from Kham and Amdo who prostrate themselves all the way from the far borders to Lhasa; no more lamp pavilions in which thousands and tens of thousands of butter lamp offerings were lit every day. Only snipers poised on the roofs of Tibetans’ homes, and fully armed soldiers on patrol; only the opening of one massive government-business sector joint venture shopping mall after another, each with inflatable blood-red plastic columns before their doors, flaunting the vulgarity and invasiveness of these new upstart operations. 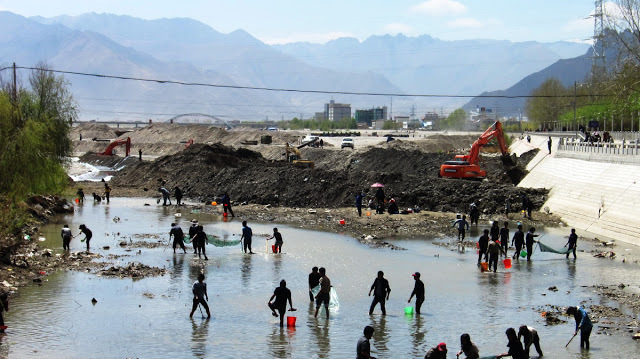 For these reasons I call on UNESCO and its affiliated organizations world-wide to stop this sort of frightful “modernization,” which constitutes an unpardonable and incalculable crime against the ancient city of Lhasa’s landscape, human culture, and environment. I call on the many Tibetologists all around the world, the people and organizations studying and researching the Tibet Issue: please pay close attention to the unredeemable misfortune that is befalling the Old City of Lhasa right at this very moment. I hope people from all walks of life will launch actions to save the Old City of Lhasa! Our Lhasa is on the Verge of Destruction! 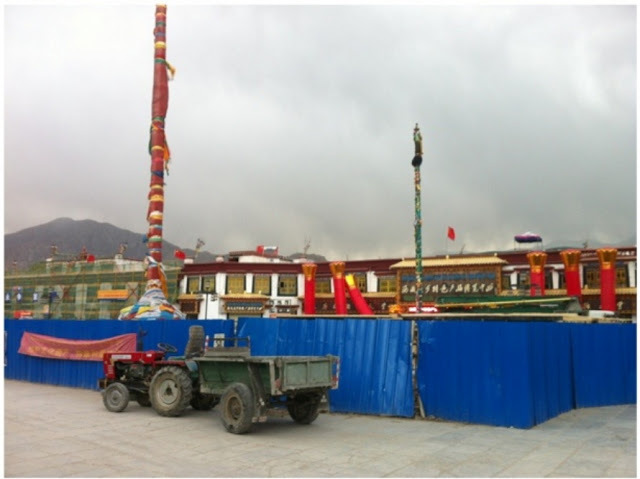 The space in front of the Jokhang, which has borne witness to so much change over the ages, has no more of the pilgrims from Kham and Amdo who prostrate themselves all the way from the far borders to Lhasa. Because they don’t have “Tibetan Entry Permits” they’re stopped at checkpoints along the pilgrimage route. 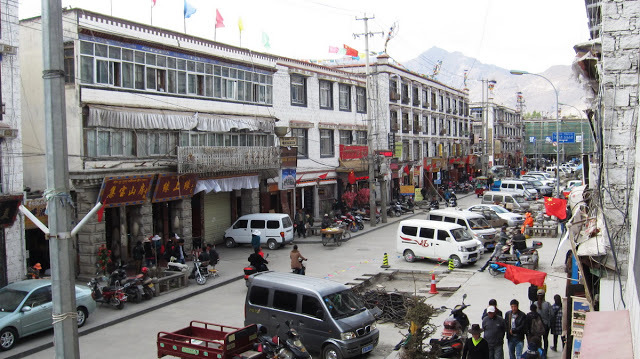 A Chinese resident of Lhasa wrote on the internet: “…Waking up one morning I took a look at this odd street. I had no idea that this was a major change. Previously, when I would relax I’d often sit atop Buchung’s stall, talking and laughing. This was my habit for over ten years. This sort of change meant for us a change in vision, or aesthetics, or lifestyle. But for Buchung it meant a change in the environment and conditions of his very subsistence. The matter truly touched those who livelihoods are in Tibet. 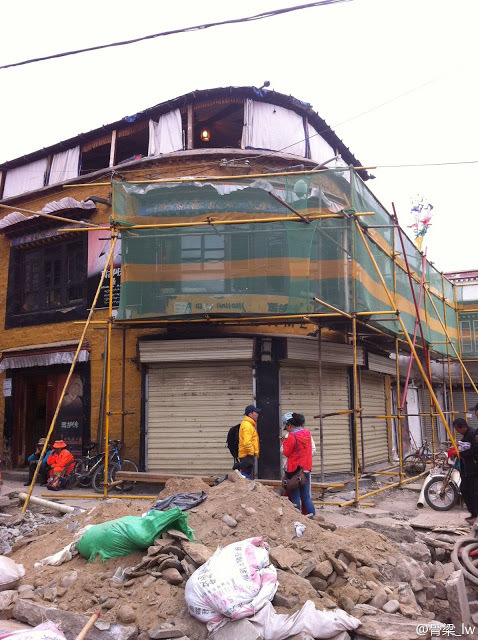 What was originally a pavilion of a thousand lamps in front of the Jokhang has been demolished for reconstruction, but it isn’t known what the further plan is. The Barkhor: the circumambulation road around the Jokhang. Tibetans going around the Barkhor. A display image of the Barkhor Shopping Mall, currently under construction. 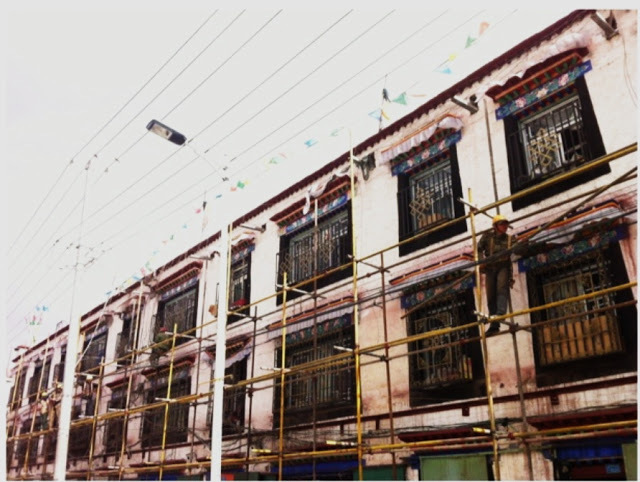 It is situated on what was originally the site of the Chengguan District government, located in the northeast section of the Barkhor, the circumambulation route around the Jokhang , very close to what is commonly called Barkhor Street, also within the Old City of Lhasa. The “Construction Survey” for the soon-to-be-built Barkhor Shopping Mall presents the scope of the project as encompassing 150,000 square meters, with an underground parking garage alone containing 1,117 parking spaces. Not too long ago the Kyichu was blocked and it is running dry. Because the colossal “Spiritual Power Plaza,” a government-business sector joint venture is being built at the edge of the Old City of Lhasa, it has been pumping out groundwater day and night, causing anxiety among Lhasa residents I wrote to Andre Alexander, who had done restoration in Lhasa, for advice as to whether proceeding in this way could wreak damage. He wrote sorrowfully in reply: “Water in Tibet is a big problem because hydroelectric stations are being built all over the place. 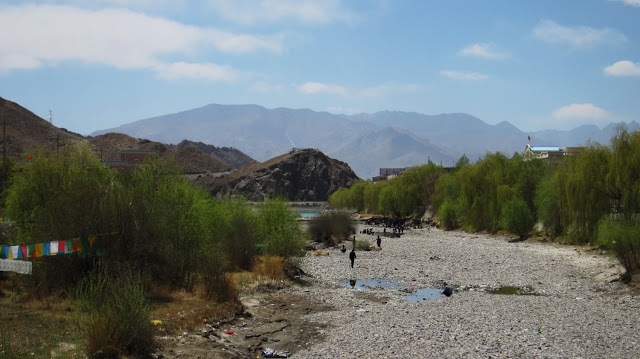 And in Lhasa itself, the environment has already been seriously damaged and polluted. 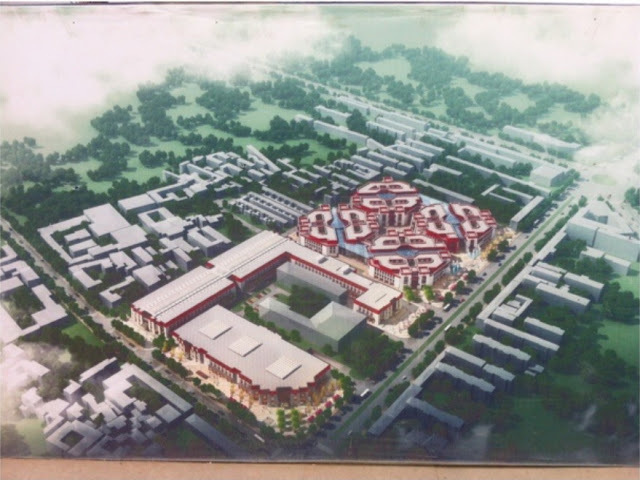 Rapacious commercial development supported by rapacious government officials is turning the Kyichu Valley into one big factory. If the Lhalu wetlands go dry then it’s too late for anything. Not too long ago the Kyichu was blocked and its waters are running dry. A lot of Tibetans are spontaneously going out to save fish in the little that’s left of the water. This is really a terribly distressing and symbolic scene. 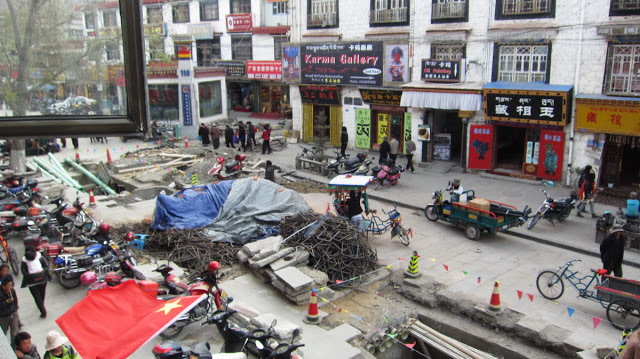 Mentsikhang Road in the Old City of Lhasa is also being dug up. During the time of the “Destroy the Four Olds” campaign of the Cultural Revolution, innumerable Buddhist images looted from temples and monasteries were buried on this street to make a show of trampling on the “Four Olds.” I don’t know whether or not any of these Buddhist images have been unearthed at present, while the city’s guts are being cut open. 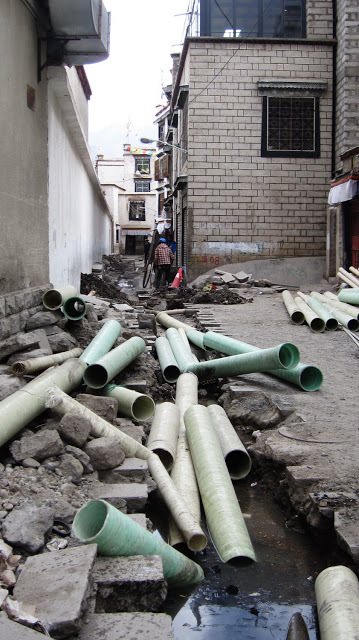 Mentsikhang Road in the Old City of Lhasa is also being dug up. During the time of the “Destroy the Four Olds” campaign of the Cultural Revolution innumerable Buddhist images looted from temples and monasteries were buried on this street to make a show of trampling on the “Four Olds.” I don’t know whether or not any of these Buddhist images have been unearthed at present, while the city’s guts are being cut open. The Old City district of Lhasa. A street in the Old City of Lhasa. A small alley in the Old City of Lhasa. Its like painting over a Van Gough, or putting acrylic color over an antique chinese painting – its destroying and wasting the original beauty of the place. They have totally no understanding what tourists wish to see in Tibet – a taste of Tibet’s original culture, not shopping malls! The most important thing is not to pollute the environment especially its water. This has made me cry. I’ve never been to Lhasa (and maybe that’s a good thing, I wouldn’t want to be part of the problem) but I did meet Tibetans and Tibetan culture in Northern India and Nepal and I have read and watched films about Lhasa, Tibet and Tibetan Buddhism. I wish I knew how to make the world sit up, take notice and intervene in what appears to be the gradual destruction of a people, culture and place. What can we – small people in the West – do, to help? For now, I will share this blog. Dote, this is about what the Chinese wish to see in Tibet, and the Chinese authorities wish to see fewer Tibetans and more Han Chinese. Woeser – thank you so much, it makes me feel physically ill, but not surprised. 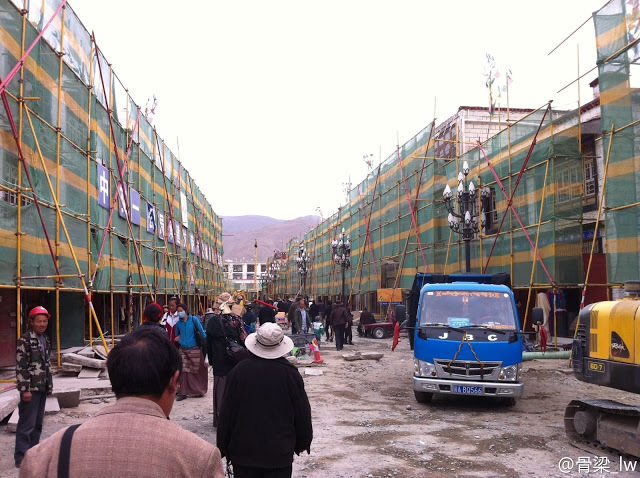 I’ve been coming and going to Lhasa for over 10 years now and the changes, even to me are appalling. I recognise so many of these photos. Personally, I just continue to tell my version of the Tibet story and people listen. But it is a small candle in the wilderness, I’m afraid. Keep up your good work and Tashe Delek. I am so very sad for the tibetans remaining in Lhasa and deeply so for the great Tibetan heritage being downtrodden by these “hungry ghosts” of greed and carelessness. It is clear that only Compassion for these lost ones (chinese authorities) be expressed. That’s a lovely — or unlovely — point, Bryan. One imagines all that has disappeared. And these trappings, the superimposition of a value-set of a contradictory culture, assume a quite unwarranted superiority over the Tibetan people, from whom (one hopes) the Chinese have a lot to learn someday. Thank you very much for all your contribution in keeping the Tibet issue alive through your messages, poetry and articles which has inspired many of us. As a Tibetan women, I am very proud of you and your courage and pray that you are able to spearhead the struggle until we meet our goal for a free Tibet where Tibetans can live on our own terms and are not dictated by the Chinese authorities. 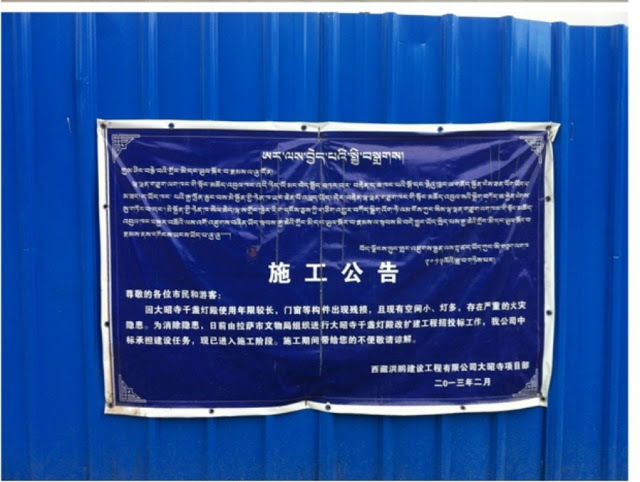 I will do my part in campaigning for the “Stop destruction of Jokhang Temple” and spread the message. Sincere prayers and Tashi Deleck to you. SAD sad sad, not even a place to sign some protest – no power – but prayers. No light – but candles. Very sad to see the destruction of the original city and its environment. No doubt the occupying force of Chinese government people see this as progress. The Tibetan cause has the same importance as the civil rights movement had in 1950s America. The world ignores the Tibet situation at its peril. Everyone is afraid to stand up to the Chinese. They are like a virus moving slowly through the world ruining econemies and spreading their cheap shoddy produce which is made at the expense of the poor down trodden chinese,who suffer under slave labour. I was there in 1998 with my kids, bicycling across Tibet and we all marvelled at the pilgrims prostrating themselves around the Barkhor circuit and the vibrancy of the Tibetan part of Lhasa – in contrast to the Chinese side of town which was just like any other modern Chinese city, boring, bland and uniform. We went there to see this ancient land before the Chinese population surpassed the Tibetan one (it was about 40% then) and changed it for good. Since then I have lectured many times about the problems facing Tibet due to assimilation. This destruction of Lhasa is a crime against humanity. The destruction of a people, a thousand plus years tradition and a way of life. And we in the west do nothing about it. Our governments kowtow to the Chinese because we want access to its economy for our resources and products. Our businesses set up there where labour costs are cheaper than at home, leaving our own people unemployed. We buy cheap Chinese goods that have replaced our own. In short, we are as responsible for this wholesale destruction of Tibet, almost as much as the Chinese, for standing by and doing nothing. Shame on China and shame on us. No matter how much the Chinese try to ridicule Tibetans, the culture, the Buddha, the Dharma and the Sangha, they can never remove what the eye cannot see. The last laugh will come from the Tibet that China can never be prepared for,that which cannot be designated, the power of Karma. Omg. Terrible 🙁 I didn’t realize this was happening. Thank you for letting us know. We will act. This is a tragedy of huge proportions! Thanks for getting the information out to us. I’ve signed the change.org noted above and will post on Facebook. Will also call the UN to see if other action can be taken. In front of the entrance of the Jokhang in Lhasa there is a stele. It carries a bilingual inscription of the Tibetan-Chinese agreement of the year 821 btween the Tibetan king and the Chinese emperor: “Tibet and China shall abide by the frontiers of which they are now in occupation. 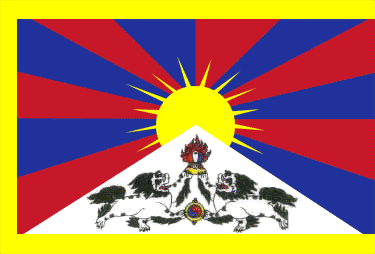 All to the East is the country of Great China, and all to the West is the country of Great Tibet (…)”. The stele has survived the Cultural Revolution. I wonder if it will survive the present “renovation” of the Barkhor. do you have a photograph? I am utterly shocked and dismayed. It is a crime to humanity, history, culture and its people. their faith and spirit will survive this massive invasion and criminal act. The Chinese constitution promises religious freedom: a lie. The Chinese constitution promises to respect the language of minorities: a lie. The Chinese just want to destroy Tibetans – and they hide behind lies. Lhasa shoulnd’t be destroyed. I bag chinese governement to stop dstruction. It’s not for tourism, it’s not for progress. It’s to wipe out all traces of that which matters to Tibetans. Its not a UNESCO issue, It’s a question of HUMAN RIGHTS. Estuve en Lhasa en agosto de 2008 y lloré de pena al ver que el Tibet viejo es apenas una sombra de lo que fué. El Potala es un museo y una atracción. Hasta los tibetanos resultan una atracción. Lo que antes era normal, cotidiano, ahora se fotografía como exótico. finally, “Lhasa” is in our hearts and can’t be destroyed….. and one day, that will come – it is just a matter of time – chinese will leave Lhasa and a new Lhasa, a tibetan one will be brought into world by us. So we never should hesitate stand up for Tibet. it to destroy any remnants of goodness & belief for the Tibetans to hold on to. Its criminal. If this is listed as a heritage site by UNESCO, then they must act. This destruction of Lhasa and Tibetan culture must stop– it will not help the Chinese to further their interest in the world at large–it will only bring problems and suffering. I hate to say this, but it appears to me that Lhasa is already lost forever. China has succeeded in destroying a beautiful, exotic and incredibly meaningful culture and replaced it with garbage. The collective negative Karma for the Chinese people for this must be enormous. As a Buddhist I find myself having mixed emotions about this. On one hand, what happened to Tibetans at the hands of the Chinese is deplorable (to say the least), but as we are all aware, the upside is Tibetan Buddhism (which I follow in my own practice) has spread around the globe because the Dalai Lama and so many monks and great teachers were compelled to leave, spreading the Dharma to countless thousands (millions?). Since we cannot turn back the hands of time, perhaps we should try to accept that all things happen for a reason and move on. This does not mean we should not continue to assist Tibetans trapped in Tibet under Communist rule of course, only that we can experience equanimity with the big picture even if Tibet is never returned to Tibetans. Since you are speaking as a practicing Tibetan Buddhist, I’d like to ask about an apparent dissonance in Tibetan Buddhism’s precepts and its politics. Why all this insistence on preserving the “status quo” when “everything changes” — indeed, mandela sand paintings are routinely created and destroyed in honor and remembrance of this basic Buddhist fact of life? Personally, I believe in historical preservation but I’ve often note this gap between the faith that’s so tightly held (and held to be under attack) and what appears to be an insistence on maintaining, as I say, the “status quo”…is it just a matter of degree? Is it simply because it is Han Chinese causing it?? Thank you, Woeser, for your continued truth-telling. I have shared the petition on Facebook and will keep all Tibetans in my heart, and hope there will be a change. When governments act out of ignorance, our very planet suffers, along with the people and animals. The blind brutality of the Chinese government seems to be incurable, but there must even be a limit to this. The Barkhor of our memories will last, even when the Jokhang stands alone. Surrounded by the fake jolly red decorations, the simplicity of spirit that has been self-constructed for centuries cannot be moved. My heart breaks seeing these photos and reading about the continual destruction of this wonderful city and it’s people by the Chinese government. While I have been incredibly fortunate to visit the country of Tibet and spend time in Lhasa, I recognise that I was a tourist and so am partly to blame for the development that is happening there. In saying that, ‘responsilbe tourism’ and maintaining places as they have been for centuries are what tourists are after these days and so restricting touirst numbers would be something I advocate for, if it meant leaving the city and it’s people as they are. Getting the ‘Disneyland’ version of Lhasa is nothing compared to it’s true self – and if tourists are after that – then they should go to Disneyland. Most revolving! I pray the world will stop this amazing crime against us all! This is happening all over Tibet! These pictures have brought tears to my eyes. I was in Lhasa in 1995 which was I believe before many of these destructive changes occurred. Many pilgrims were still present and there was at least still a sense of the old Tibet. I had no idea of the extent of the damage. I started to do a search on the mall in front of Jokhang after my wife had told me about it a couple of days ago and I was dumbfounded, couldn’t believe it really. She grew up in communist Poland and so had a better sense of what these people are capable of. I think what represented the destruction in my eyes were the blow up air columns in front of Jokhang, it reminds me of the emptiness of such displays during the commercial holidays here in America. I am at a loss for words. Gross!! 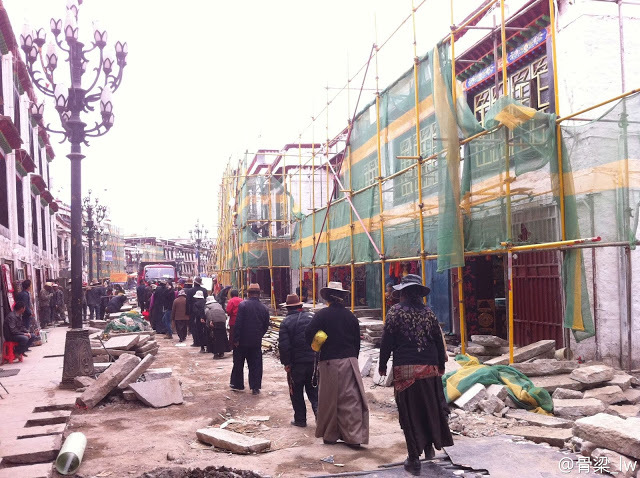 The Chinese are turning Tibet into an ugly, giant chinatown. Enough bloody china enough,The world is watching your greed and creulity on TIBETANS.I hope the coming generation of your may not have your mentality so,what you gonna explain for them .Better come on a track before its too late. Please stop the destruction of the old city of Lhasa. 1) “All those identical squares found throughout China, that are meant to display and project supreme power and authority” may actually be more about making citizens feel more connected to the regime, believe it or not, than some attempt at terrorizing them. I was just reading B.R. Myers’ “The Cleanest Race” last night about North Korea and, citing some scholarship, he made the observation that all these grand, even grotesque, monuments are not necessarily only about impressing a regime’s subjects. As an atheist, I can be impressed by the beauty of a Catholic cathedral even while recognizing all the lives lost at the stake throughout the church’s history. I think the Communist authorities may actually have a similarly odd but fairly sincere paternalism in mind when erecting their gigantic monuments of socialist public art. 2) I’m amused to think about all the outraged Westerners bemoaning how such projects will spoil their authentic experience as tourists. I’m sure there’s some genuine sympathy for Tibetan sensibilities mixed in there somewhere, but as folks who will haggle down a Tibetan street peddler just as easily as they decry Chinese politics and policies (just read “Sky Burial” by Blake Kerr, who is one unbelievably cheap tightwad of a rich kid, for all his concern over human rights in Tibet), I remain skeptical as to how much they would care if it weren’t Tibetans in an independent sovereign Tibet that did the same. feeling helpless…….desparate….how can we join and stop it…..suffocating indeed….